Mapping of intracardiac electrical signals is a well-established clinical method used to identify the foci of abnormal heart rhythms associated with chronic myocardial infarct (a major cause of death). These foci reside in the ‘border zone’ (BZ) between healthy tissue and dense collagenous scar, and are the targets of ablation therapy. 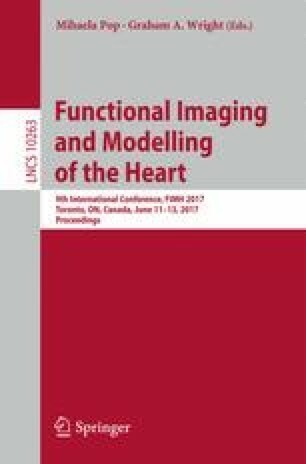 In this work we analyzed detailed features of the electrical signals recorded in a translational animal model of chronic infarct. Specifically, activation maps and bipolar voltages were recorded in vivo from 6 pigs at ~5 weeks following infarct creation, as well as 6 control (normal) pigs. Endocardial and epicardial maps were obtained during normal sinus rhythm and/or pacing conditions via X-ray guided catheter-based mapping using an electro-anatomical CARTO system. The depolarization and repolarization maps were derived through manual annotation of electro-cardiogram waves, where the peak of the QRS wave marked the time of depolarization and the peak of the T wave marked the recovery time. Then, at each recording point, activation-recovery intervals ARIs (clinical surrogates of action potential duration) were found by subtracting activation times from repolarization times. Overall, we observed that ARI values in the BZ have recovered from the acute stage and were close to values in healthy tissue. In general we observed a weak negative correlation between the activation times and ARI values, also not a significant variation (p < 0.5) between mean ARI values in the BZ area and those in the healthy areas. This work was financially supported in part by a grant from CIHR (MOP # 93531) and a summer student award D&H (Sunnybrook).